Creative gift for new apple watch owners as a birthday gift or Holiday Christmas gift. The Fullcharg Charging Dock is a sleek new innovative design that takes the mess out of charging. 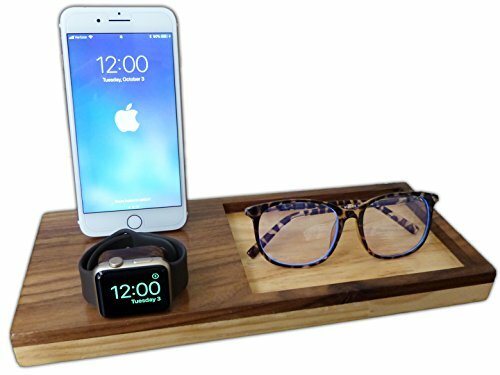 Beautifully display your iPhone and Apple watch on Fullcharg's high quality pine and walnut wood stand. And always have your items on Full Charge. SLEEK 2 IN 1 CHARGING STAND: Compatible with all versions of the Apple Watch Series 1 and Apple Watch Series 2 (38mm & 42mm) and iPhone 7/ iPhone 5/5C/5S/6/6Plus/6S/6SPlus/7/7Plus/SE/8/X. HIGH QUALITY NATURAL PINE AND WALNUT WOOD: A chic, clean, organized display for your iPhone and apple watch. Items will be in natural color as seen in pictures. ANTI-SLIP SILICON GRIPS : The bottom of your docking tray is secured with 4 grips to guarantee your dock will stay stable and prevent scratches on your desk or nightstand. If you have any questions about this product by Fullcharg, contact us by completing and submitting the form below. If you are looking for a specif part number, please include it with your message.